Sometimes life keeps you guessing about exactly what you should do next and you just have to be a little inventive, dive in and maybe sometimes even take a little risk. With that in mind, today I decided that my recent back problems had taken up enough of my time and that I would start easing myself back into riding. 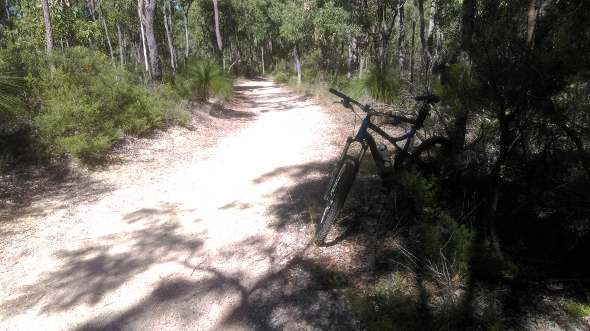 So, I dusted off the squishiest, most forgiving mountain bike I own to cushion my flip side lumbar regions, packed a few essentials into a small canvas satchel and took off for one of the slowest, most non-mountain bike urban mountain bike trips ever embarked upon. And despite photos that may give the impression of the contrary, suburbia was never more than a literal stone’s throw away. The bike for this trundle was my 2010 all alloy Avanti Torrent. Yep, those are 26 inch wheels and that is a big old triple snuggled up to the bottom bracket but, guess what, it’s still as effective a trail bike as the day I got it (and likely as effective as most new trail bikes) despite some marketing which suggests that if you don’t upgrade to carbon and 27.5 or 29 inch wheels, you will die. By the way, that contraption attached to the seat post is not a battery pack or some kind of posture correction device. It’s my Abus bike lock which has proven to be very handy indeed. 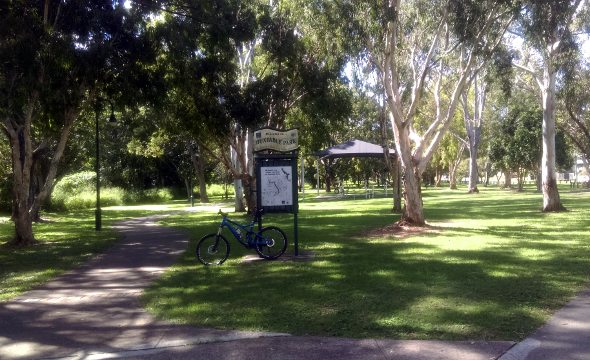 And so I began my little jaunt at the northern end of Trouts Rd at Aspley, following the power lines along the dirt section to the entrance of the Chermside Hills reserve. 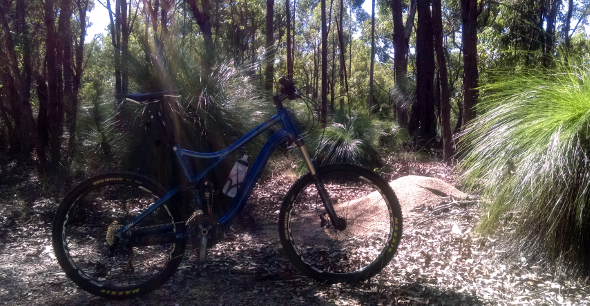 In pursuit of some photos and a bit of a spin, I entered the reserve and putted gingerly along the fire trails marked as “multi-use” on the Brisbane City Council map admiring the large groups of Grass Trees, Bottle Brushes and a few kangaroos that crossed the fire trail in front of me. After taking a few photos and wrong turns, I ended up back at the same gate I started at. Heading down the Trouts Rd powerline trail towards Hamilton Rd, some of the hills were steep and I had to fight my natural urge to mash up them as fast as I could (which is not really that fast by most yardsticks). It was just as well I held myself back because after the first hill, even at the slow pace I was doing, I felt like I’d just smoked a box of cigars. 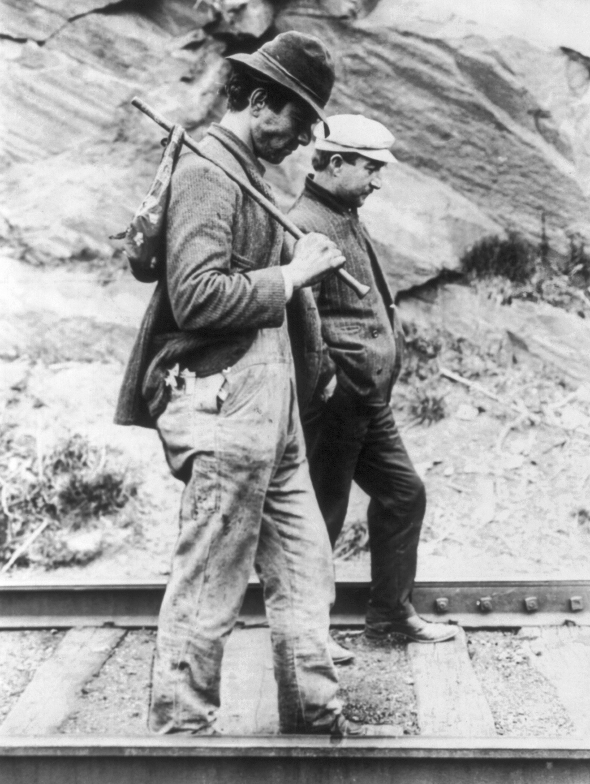 Once I got my breath back, I rolled down the other side along the loose shale to the lowest point of the trail where my eye caught the shimmer of a massive spider web strung across the trail high above my head. 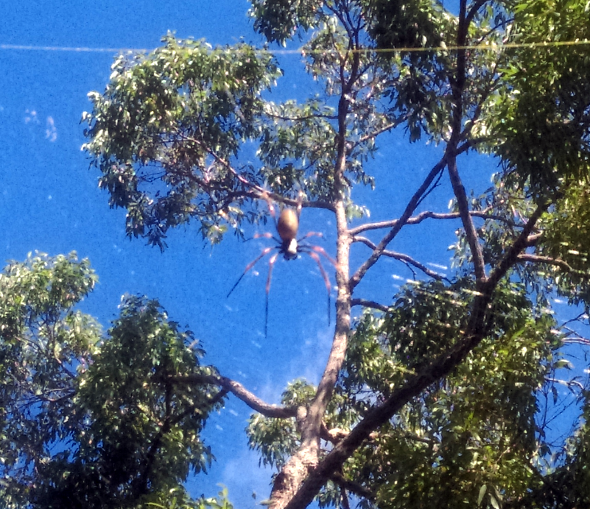 The large arachnid edged from the centre of it’s web as I focused my camera on it – perhaps a little too much attention for a little too long. 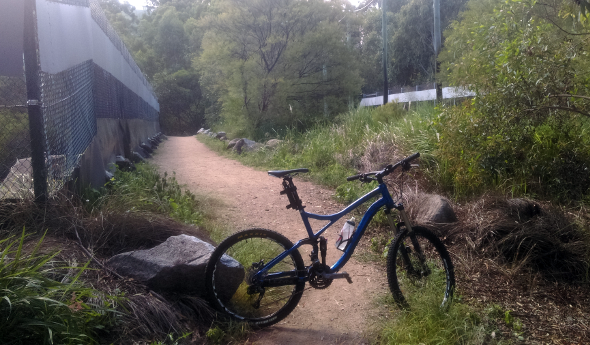 A little further and the ground leveled out as I crossed Cabbage Tree Creek over a small concrete spillway and scampered onto the tarmac up to the traffic lights at Hamilton Rd. 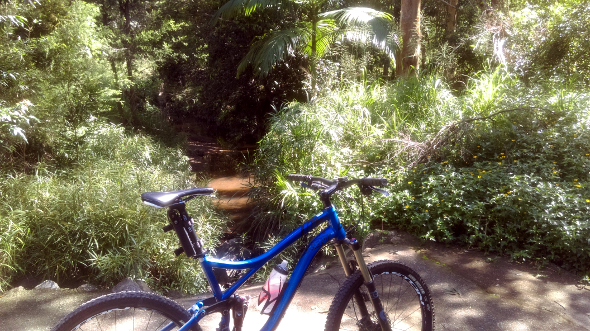 Chermside Hills always brings back a flood of memories of my younger days in the nineties when the reserve was fully open to mountain bikes and I would rip through on my Mongoose NX 8.1 with my comrades. Good times. From there I headed up the hill toward the “nature bridge” that spans Hamilton Rd which exists to allow wildlife and people (so, wildlife) to cross safely between Milne Hill and the Raven St reserve. Packed with soil and vegetation, this bridge is purpose built to let wildlife cross safely over Hamilton Rd. 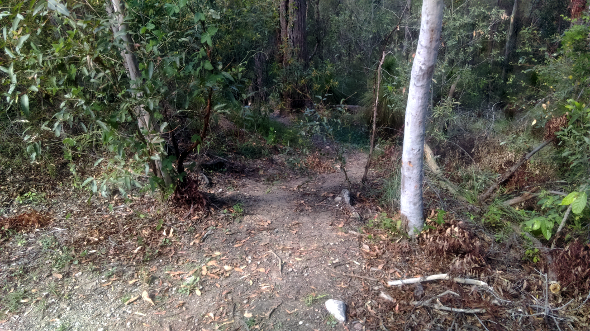 With the spring loaded gates bumping shut behind me, I headed over the bridge into Raven St reserve where a steep little goat track descended down to the fire trail below. This little trail is a lot steeper than a photo can capture. 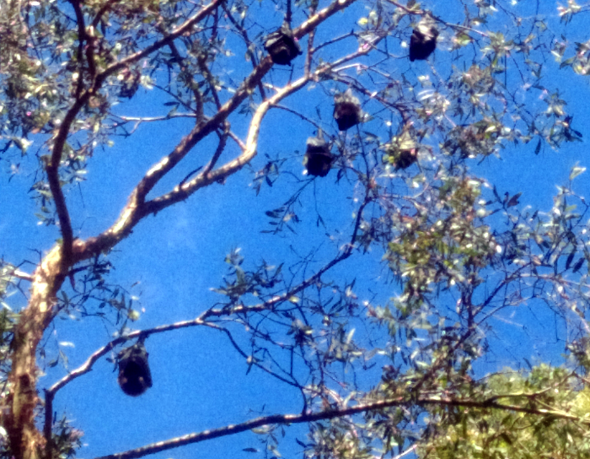 A short while later, I popped out at the Raven St reserve bat colony and proceeded to follow Downfall Creek to Huxtable Park. 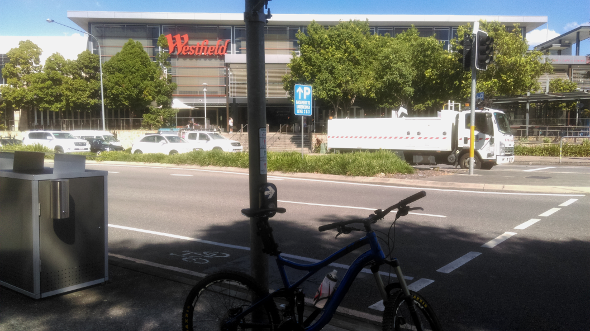 Meandering along the Downfall Creek bikeway, I ended up at the Hamilton Rd roundabout where I made my way up Webster Rd to join up onto the bikeway again and finally ended up at Westfield Chermside. By this time lunch was in order and I dined on Hanaichi’s finest. After lunch and a brief spell, I turned the big rig around to point back to the way I came and headed home. And all through today’s ride, it was this album that bounced around inside my cranium and I figure that if I have a song stuck in my head you can too, dear reader. If that resonates with you as much as it does with me, you should consider helping to put nutrients in the bloodstreams of the individuals who made it by buying their albums at the Hot Snakes Subpop page. Finally, a few other bits and pieces to cover off. Queensland Bike Week is on from the 28th April to the 7th May. I’m going to make every effort to partake though to what extent will be dictated by the condition of my back after the little jaunt described above. 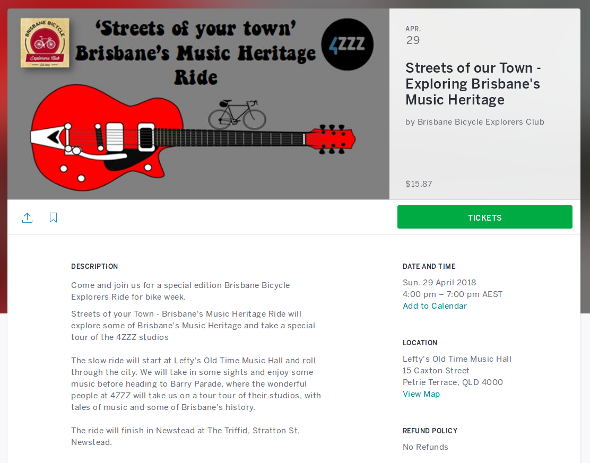 At the moment, I have my sights firmly set on the Streets Of Your Town Brisbane Music Heritage Ride. 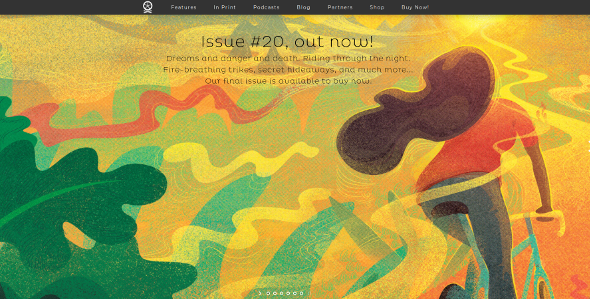 Finally, if you’re looking for something to read that’s higher quality than the rubbish I’m churning out here, you’ll have to grab a copy of Boneshaker magazine‘s latest edition which sadly will also be their last. They’re closing their doors though they hint that they may be returning in some other incarnation. Maybe they have big plans or maybe they’re just making it up as they go. I am so jealous, it is amazing all the facilities you have. It is sad how as you get older (body not what it used to be) you long for those good times with friends and the adventures you had together. Wondering where all the time has gone. I hope your back coped with the ride. Thanks David, the back seems to be holding up OK so far.